A small PC for controlling industrial devices, directly mounted in machinery rack. It was made for controlling telephone patch machines, but can be used to control any other devices using probably PC104 bus. Originally it had a 16MB Disk-On-Module (early SSD) SSD drive containing DOS and telephone patch controlling software. Name MKS may come from "Moduł Komputera Sterującego" - Controller computer module or similar. 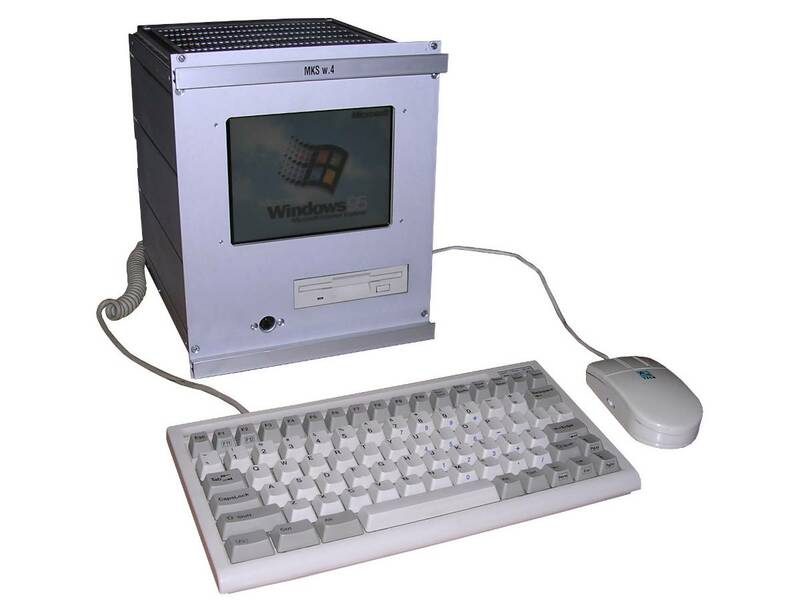 The CPU is AMD 5x86 running at 133MHz, which is a 486 giving performance roughly comparable to Pentium 75MHz. Originally it had 8MB of RAM in SO-DIMM module (SIMM-compatible in electronics). 32MB EDO DIMMs present in some Pentium I ThinkPads may work. 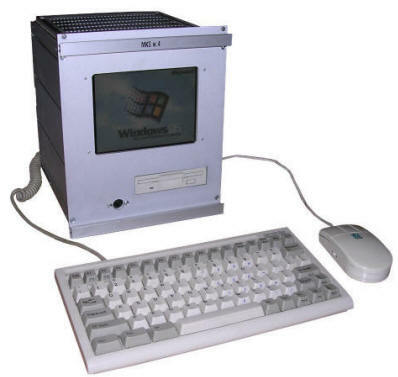 Inside, there is a complete small PC104-like mainboard with bus on computer's rear, LCD driver with 640x480 panel, 3.5" 1.44MB floppy disk drive and keyboard connector in front panel. The machine is powered by 5V and 12V DC from external power supply unit. Operating system(s): DOS / Windows 95. I got 2 units from scrapping old telephone patches. One has been used while another one is spare unit with protective foil on LCD screen. The new one is untouched (except there is no firmware) while the other one had its disk module removed. I replaced it with PATA drive and added 32MB RAM module to try with Win95. The power supply unit, Pulson PSU605 also made in Poland for this application, is not only for this machine, but also for telephone patch modules, so it also has -12V, -5V and -48V, they are not used in PC. The machine starts trying to boot from floppy or internal HDD. If no BIOS Setup is present (most of these machines), a MULTISET tool should be used. If booting from floppy is disabled, DOS can be booted from disk drive or hard disk can be removed causing error and machine boot. As the last resort, it is possible to ignore CMOS settings by plugging a special connector, it is described in manual but not tried (see files section). The only thing to remember is to be careful with LCD resolutions. LCD driver is prone to mis-adapting of settings if ran at higher resolutions than 640x480. Then it may not go back. Because LCD driver board is not documented and there are not menu/configuration buttons on it, you will have to foce it to go to previous mode by switching resolutions again. Another problem with graphics chip is that it's rare. It's GD6235, usually applied in embedded/mobile applications. And contrary to what Wikipedia says, it's not always compatible wih 5420. Some applications allow to use 5420 drivers, but this one may not, so you will be stuck at native slow VGA mode... until you try SciTech Display Doctor. There is a SciTech Display Doctor 7.0 Beta released (look for 10MB file sdd-win-7.0.0.340-BETA.exe and "CSCKnight" serial number), but it will not work with such old chips. I found 6.x free versions released with serial numbers by SciTech long time ago work perfectly. Remember to be extremely careful when changing resolutions not to make LCD driver mis-align the display.